You are currently browsing the Smart Shopping weblog archives for October, 2017. Lanctot for Any Kind of Flooring – How About Warming your Feet on Heated Floors? If you’re planning a reno project which involves flooring, I would head right to Lanctot. For over 130 years, the Lanctot family has been selling flooring, and has always been known for choice and service – and their prices are low all year round. Can you just imagine how many satisfied customers that adds up to? They have a wonderful option for our cold floors in our cold winters – heated flooring. They sell the Ditra-Heat system from Germany which prevents cracking of ceramics and stone. DITRA-HEAT combines the flexibility of loose heating cables with the ease of installation of mat systems. Cables can be placed wherever heat is desired, without creating height differences in the floor. Self-leveling compounds are not required reducing installation time and effort. The huge Lanctot warehouse offers hundreds of options for floating and hardwood floors (look for the mark-down bins too), including condo solutions and ceramic tiles You can select from amongst 500 area rugs, carpeting and vinyl flooring ( remnants too). There are options to decorate walls, and even staircases can be created here. In floating floors, you have many tree options such as: oak, maple, ash, beech and cherry, as well as ones that look like natural stone or ceramic. For hardwood options, there’s cherry, white oak, red oak, hard maple, silver maple, ash, wild cherry, beech, larch and walnut. Where else could you find so many exotic species too: jatoba ipe, bamboo, tauari, cumaru, cabreuva and tiger wood. An entire wing is dedicated to ceramics in many types and sizes for bathrooms, kitchens and hallways. Along with the ceramic and natural stone tiles, you can also buy granite, marble, slate, porcelain and even faux wood. You can also shops for many types of wall coverings like decorative stone, natural stone, decorative brick, wood siding and decorative panels. Lanctôt also offers two types of staircases: modular and traditional. Staircases generally form the heart of a home as they can usually be seen from the entrance, and often take center stage. They offer services for insurers and claim adjusters. Both individuals and businesses happily buy here. It is so nice to shop at a store which has the comfortable feel and friendliness of a family business. Posted in Family Business, Household | Comments Off on Lanctot for Any Kind of Flooring – How About Warming your Feet on Heated Floors? Boutique Java Kap, sells capsules for all single serve coffee and espresso machines. This is coffee heaven, since they have over 350 choices. 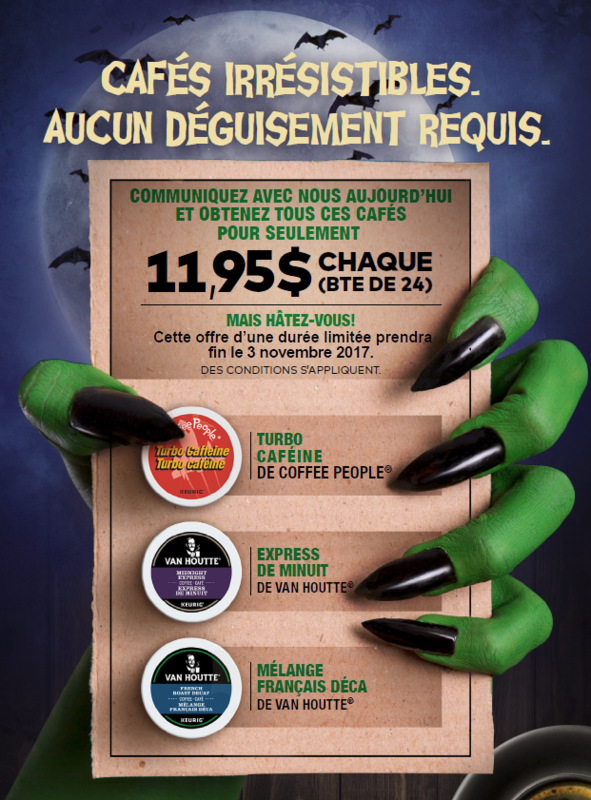 Right now there is a seasonal special of 24 K-cups for only11.95: Coffee People’s Turbo Caffeine or Van Houtte’s Midnight Express or French Roast Decaf. 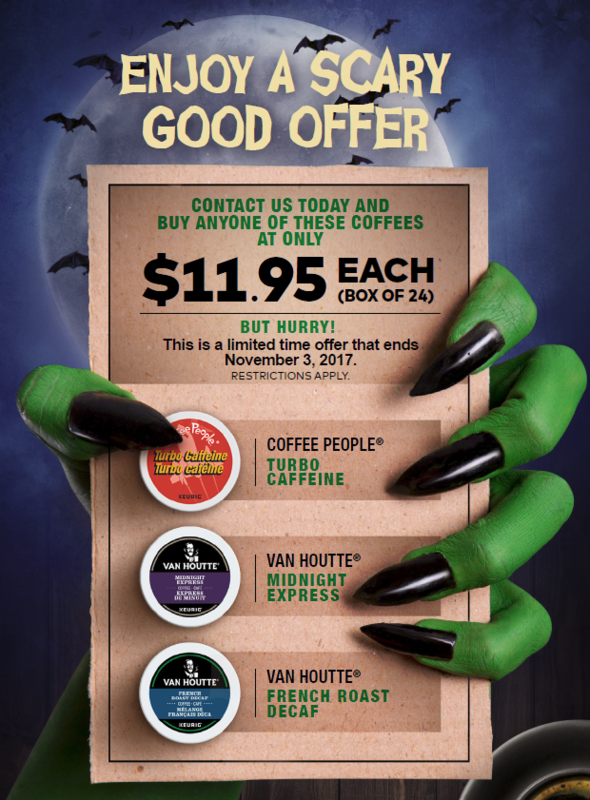 The sale is only on the closed boxes of the above mentioned blend. Does not apply to any other box(es)/blends in the store. Does not apply to the mixes. Can not be combined with coupons or any other specials. Hurry in, offer ends November 3rd. The walls of this shop are lined with bins of capsules, and you can wander through and select a variety of flavors using their cute shopping trays , or you can buy them pre-boxed – all of the same kind. 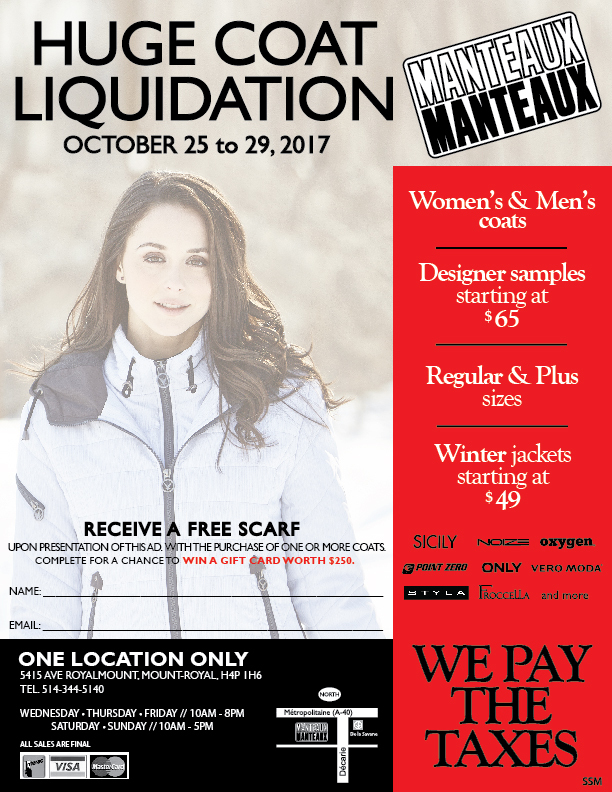 Stay warm and look fantastic this winter and save a bundle by going this week to Manteaux Manteaux’s huge coat liquidation sale. Save up to 70% on women’s and men’s coats, regular and plus sizes. Take advantage of the 35th Anniversary of Verti Store sale right now. 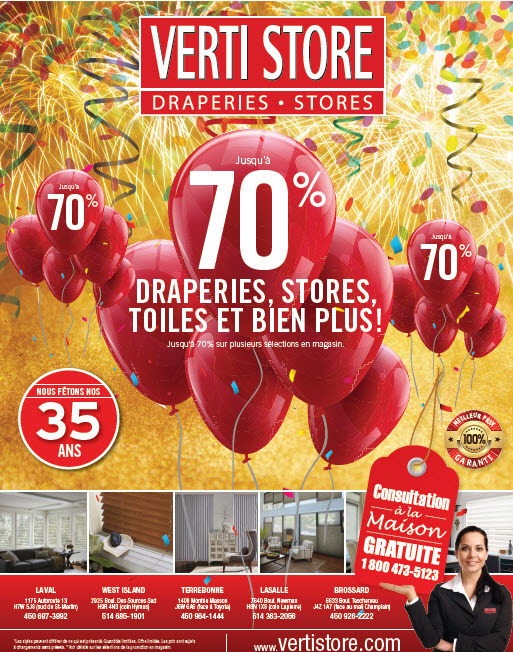 They are having a special sale of up to 70% on blinds and draperies. From the traditional to the contemporary, Verti Store carries a vast array of blinds and draperies that suit every taste, every window size and every budget. Stop by one of their 5 locations or call in to take advantage of their completely free and no obligation shop-at-home service. For the same pricing as in store, you can shop in the comfort of your own home with the help of their decorating consultants. This window-covering mecca will amaze you with 10,000 sq. ft. of displays of custom made PVC, aluminum, wood and faux wood vertical and horizontal blinds; beautiful shutters; panel tracks; roman, pleated, cellular or roller shades and affordable draperies and drapery hardware. Expect to find major brands here: Altex, Shade-o-matic, Levolor, Graber, Vantage, MaxxMar. They also offer many in-stock versions of the above products as well as over 1,000 rolls of fabric to choose from. Verti Store has been serving their customers for over 35 years, providing them with the most competitive pricing possible. Whether you’re working with a restricted budget or sky-is-the-limit resources, Verti Store’s wealth of choice and knowledgeable and experienced staff can turn any house into a beautiful home. A gift done by hand is one that shows that you truly care. Your effort is displayed in each hand sewn stitch or stroke of your paint brush. They also carry scarf yarns (Pirouette, Bohemian and Decor by Patons), to make the latest fashion accessory item as well as other low cost items that will tempt you to start those projects that you have being putting off. Happily helping you with your project has been the #1 reason people keep coming back to this shop for years and years. With Fall finally here what better time to re-fresh your wardrobe for the new season. Who doesn’t need great pants, a well-cut coat, the perfect turtleneck sweater? 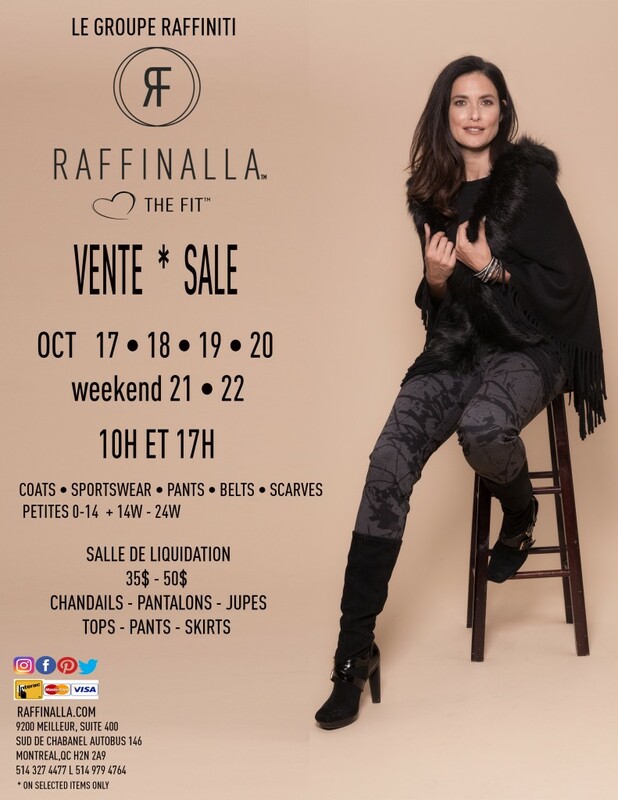 Get them for less at Rafinalla’s (Le Groupe Raffiniti) 6 day sale. Sleek, sophisticated women’s fashion made from the most luxurious fabrics can be yours. Snag selected well-tailored, contemporary sportswear, pants, coats, belts and scarves. Save big in their liquidation room with tops, pants, skirts at $35 to $50. You can also find plus sizes 14W – 24W as well as petite sizes 0 – 14, there’s something for everyone. 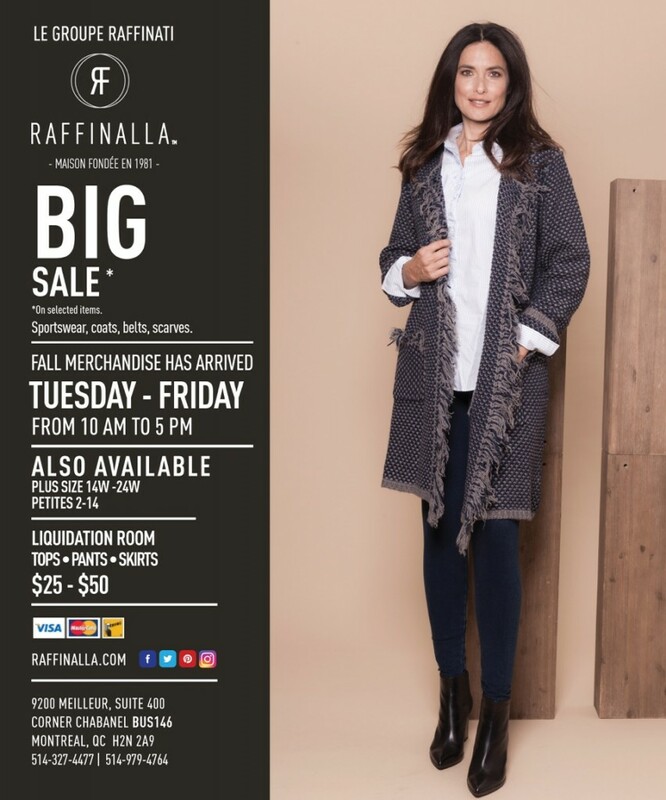 Discover for yourself Raffinalla’s fashionable, well-crafted and timeless pieces. New merchandise arriving daily. Raffinalla worn anywhere, anytime by every generation. Private appointments welcome. Back by popular demand, Freemark Apparel Brands Sample Sale gives you an opportunity to get the whole family looking stylish for Fall. 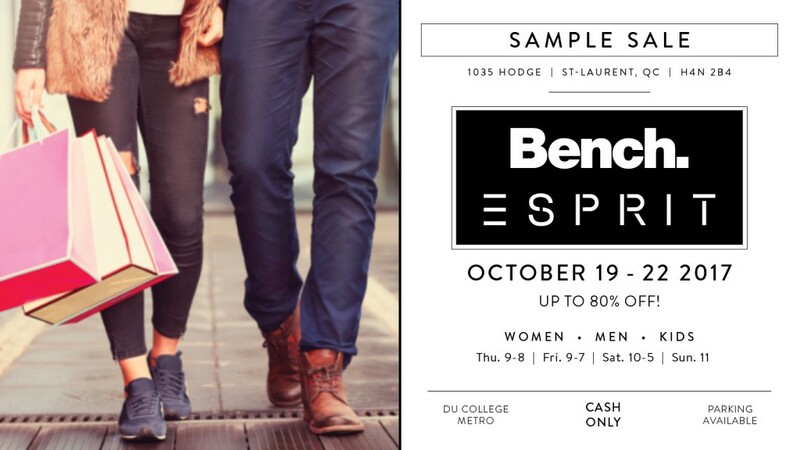 If you’ve never been to this sample sale before, you’re missing out on extreme savings on your favorite brands. Discounts of up to 80% on women’s, men’s and kids’ clothing and accessories, premium labels including: Bench, Esprit and Sylvian Heach. You only have fours days to snag a bargain on some of your favorite brands and welcome in Fall looking trendy, don’t miss out! This sale is cash only. Parking is available. 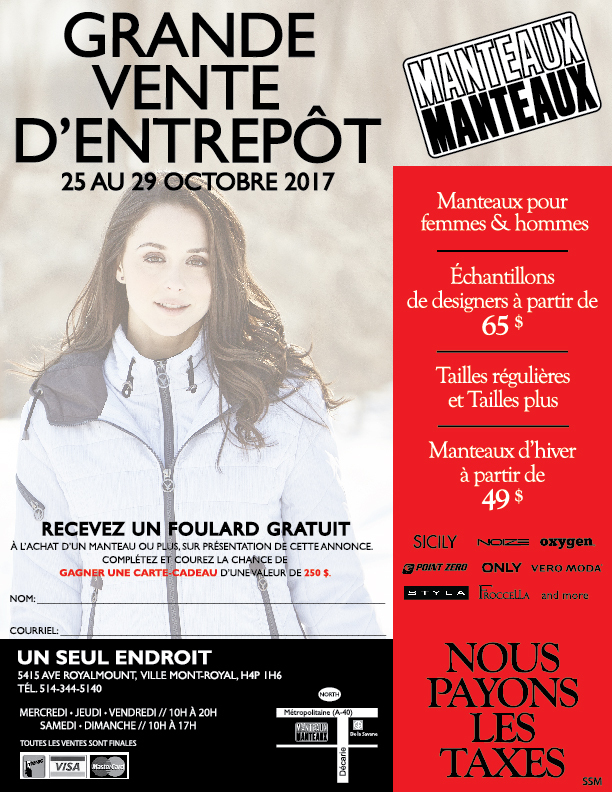 La Grande Braderie de Mode Quebecoise is the sale for 130+ of the creme de la creme of Quebec designers’ samples and ends of inventory at 50%-80% off. Men and women both would be happy shopping here for clothing, outerwear, swimwear, jewelry, and accessories. You can find outfits for the kids too. 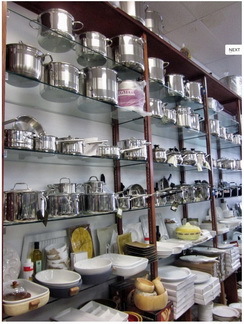 Lingerie Pina & Carmelo Sacco has been the go to place for generations for specialized kitchen equipment. They sell the “torchietto” which is a multi-functional vegetable press for sauce, jams, juices, eggplant, wine, etc. They are one of the few stores which stock different sizes sausage grinders including attachments which can be used for bread crumbs or cheese. To store all your yummies, here’s where you can buy a vacuum machine and bags too.